What stream you wish to study? The wait for Nagaland Board result 2019 is likely to be over for the students soon. The Nagaland Board of School Education (NBSE) will declare the Nagaland HSLC or Class 10 and Nagaland HSSLC or Class 12 Board result 2019 by the third week of May tentatively. To make the process of checking the Nagaland Board result 2019 easier for the students, NBSE will also publish the results online on their official website i.e. nbsenagaland.com. Students will also have the option to access the result through a live link that will be made available on this page once the Nagaland Board result 2019 is formally announced. We, therefore, urge the students to bookmark this page so that we can provide you with all the necessary updates about Nagaland Board result 2019 on time. The NBSE has released the schedule of Nagaland Class 10 and 12 board exams. Any information about Nagaland Board result 2019, however, has not yet been released. Judging from the previous trends of the Nagaland Board, the NBSE HSLC Result for Class 10 students and NBSE HSSLC Result for Class 12 students will tentatively be released during the first or second week of May. JagranJosh keeps a close tab on the activities of the Nagaland Board and any information about the declaration date of Nagaland Board result 2019 will be immediately made available here. Once announced by the Nagaland Board, the NBSE Result 2018 can be checked online through this page of jagranjosh.com. For more information on NBSE Results, the online checking procedure and other aspects related to NBSE 10th Result and Nagaland 12th Result, please read further. Where to Check Nagaland Board Result 2019? Often the students find themselves lost in the wide pool of misinformation made available by the numerous rumour mills available online. It is, thus, important that the students find a source of authentic and reliable information where they can check their Nagaland Board result 2019. The NBSE will release the Nagaland Board result 2019 for Class 10 and 12 on the official website once they are formally announced. However, a large number of students logging in to the website at the same time to check their result might result in technical glitches. So alternatively, students can opt to check their Nagaland Board result 2019 through the links nagaland10.jagranjosh.com / nagaland12.jagranjosh.com that will be made available on this page. This will ensure that the process of checking the Nagaland Board 2019 result is smooth for the students. A major concern of the students expecting their Nagaland Board result 2019 is whether they will achieve the expected marks or not. Many students often set a wrong expectation and have to face disappointment after the declaration of the results. In order to take pressure off the students and to help them set realistic expectations, we have provided the analysis of Nagaland Board 2019 result below. We hope this analysis will be useful for the candidates. How to Check Nagaland Board Result 2019? The anxiety associated with the decoration of Nagaland Board Result 2019 can often confuse the students as to how to proceed while checking their results. To make the process easier JagranJosh has listed below the key steps of the process to check Nagaland Board result 2019. After checking the NBSE 10th Result and NBSE HSSLC Result 2019 online, you can download the soft copy of the scorecard and take a printout. Abundance of information on the web also gives rise to rumours and students are often left in confusion when it comes to matters such as exams and results. To quell such speculations, we would be providing regular, timely and verified news and updates about the NBSE HSLC Results and NBSE 12th Result 2019 on this page. Our team at JagranJosh will provide regular updates about Nagaland Board result 2019 after verifying the same with the board officials. Alternatively, you can also register for the email alerts service under which our team will share the latest updates about Nagaland Board Results 2019 with you directly in your email inbox. To start receiving these alerts from today, you can submit your mobile number and email id in the form provided, at the top of this page. What after Nagaland Board Result 2019? After checking your Nagaland Board result 2019 thoroughly, students should download the scorecard for future reference. 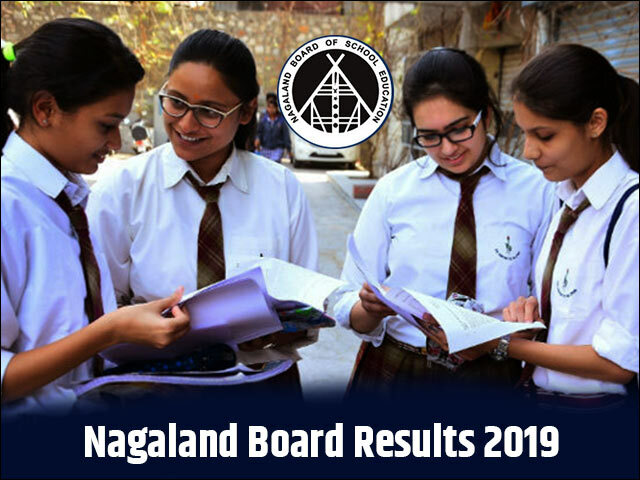 The result of Nagaland Board 2019 will be available on the official website of NBSE and can also be accessed from the links provided above. The downloaded copy of marksheet displayed in Nagaland Board result 2019 will act as a provisional status until the original marksheet is provided by the school authorities. Students must mandatorily collect their Nagaland Board result 2019 marksheet from their respective schools as it will be required for the official purposes during admission to higher courses of study. The students who are not content with the marks obtained in the Nagaland Board exam 2019 can opt for re-evaluation and re-checking of their answer sheets. The students can take benefit of this particular provision by paying a nominal fee as prescribed by NBSE and submitting an application through their respective institutions. For students who do not manage to pass in the Nagaland Board exam 2019, there is an option of appearing in the supplementary exam conducted by the NBSE. Students can appear in the supplementary/improvement exam of Nagaland board by filling in the application form that will be made available on the official website of Nagaland 10th 2019 and Nagaland HSSLC 2019. The Nagaland Board supplementary examination 2019 will be held in the month of June. Popularly known as the NBSE, the Nagaland Board of School Education is the primary school education board in the state of Nagaland. The board operates under the Nagaland state government and looks after the development and propagation of school education in the state. The foundation stone of this education board was laid on November 15, 1973, but it commenced working from October 1, 1974. The Nagaland Education Board deals with all academic operations for the students enrolled in various schools and educational institutes. It conducts exams and declares NBSE result. The organisation also conducts and controls all examination proceedings of the HSLC and the HSSLC. The Nagaland Board has declared the Class 10th and 12th Results 2018 on their official website, i.e. nbsenagaland.com. The Nagaland Board of Secondary Education has announced the NBSE HSLC, HSSLC Results today. The Nagaland Board of School Education (NBSE) announced the Nagaland HSLC Result 2017 for class 10 students and NBSE HSSLC Results 2017 for class 12 students today. Get your NBSE Result 2017 online on nbsenagaland.com. The Nagaland Board of School Education (NBSE) announced the Nagaland HSSLC Result 2017 for Class 12 students and NBSE HSLC Result 2017 for Class 10 students today. Students can check their NBSE Result 2017 online on nbsenagaland.com and nagaland.gov.in. Latest from Kohima :The Nagaland Board of School Education , Results coming today @ the NBSE HSLC Result 2016 and Nagaland HSSLC Result 2016 today. Students can visit official website nbsenagaland.com and nagaland.gov.in to check their results.